Seven years ago, I was a member of Cohort XVII. It was during our session on education that our director asked for volunteers for the position of cohort representative. It sounded like a fantastic opportunity, but I was afraid to raise my hand. I would need to be elected by these fellow cohort members I was just getting to know. The last time I had run for anything was in high school, and I lost that election pretty badly. Being the cohort rep would mean attending the organization’s monthly board meetings, reporting out on our progress, and offering feedback. It would mean speaking at graduation and the annual luncheon. Public speaking. Yikes! It was precisely because it frightened me that I ended up raising my hand that day. Much to my surprise, I was selected. At that time, I had only the inkling of a philosophy that would come to shape the rest of my life. It was to seek out and to do the things that scared me the most. Since that fateful day in 2011, I have repeatedly volunteered for the things that scare me. I will be honest in that I have not succeeded every time, but each time, I have learned something valuable. “Barbara” will accompany Baffa on the E/V Nautilus, and will be sent into the deep sea aboard a remotely operated vehicle (or ROV), where she will be subjected to incredible water pressure. She will later be used for science education (in a much smaller state). Three years ago, when I saw an application for a fellowship that would take me to sea aboard a scientific vessel, where I would live and work somewhere in the Eastern Pacific Ocean (where to be determined), for a period of 1 to 3 weeks (again, to be determined once/if I was accepted), it scared the heck out of me. I’d be handling communications, serving as a bridge between the expedition and my community when not aboard, and bridging to the entire world when I was! Voices of doubt and insecurity cried out as I read the application guidelines, and considered whether I actually had the guts to submit one. What if I applied, and was not selected? What if I was too old, not smart enough, not interesting enough? What if I didn’t have the right education? What if I didn’t have the right experience? What if I didn’t adjust well to life at sea; what if I suffered from seasickness, or homesickness? What if I was just bad at it? Added to all this self-doubt was the slight complication that applications were due in only two days. Could I seriously put something together in such a short amount of time? Yes, I was scared. But I took a deep breath, quelled those naysayers clanging in my head, and got to work on my application. It was precisely because I was scared that I had to do it. In a few days, I will be sailing on the E/V Nautilus for the third time. Long story short, I was selected with that first application. I had an amazing time, traveling to the Galapagos Islands, checking things off my bucket list, and getting to know amazing people from all over the world who were also part of this Corps of Exploration. I applied again in 2016 to be a Lead Science Communication Fellow, and explored the ocean right off our own Southern California coast. Once again, it was an amazing experience, although different in many respects from the first voyage. I suffered more from seasickness the second time around, and the nonstop schedule made me really, really tired at times. But what I gained from it far outweighed any discomfort or homesickness or seasickness that I might have suffered from. Board members pose with “Barbara” after signing her. From left to right, Vice-President Tom Cohen, Secretary Rudy Gonzales, Jennifer Caldwell, Herb Gooch, Program Manager Krista Eulberg, Brick Conners, and Tiffany Morse. Since shyly raising my hand in response to the call for cohort representative, I have done this amazing thing, as well as a few others that also scared the heck out of me. This is why: in the space between “could I really do that?” and “I can’t believe I did that!” is where growth lies. When we challenge ourselves to step out of our comfort zone, we embrace an opportunity to grow and change and become better: as people, as partners and parents, as employees and employers, and as leaders in our community. Our comfort zone is what keeps us glued to the couch and stuck in a rut. It’s only by shaking things up, by challenging ourselves, by doing the things that scare us that we break out of old patterns. I am very thankful for my participation in the Ventura County Leadership Academy seven years ago. Not only did I learn valuable information about our county, but I acquired leadership training that helped me to grow and step up to lead in my community. Our alumni take the knowledge and the skills they acquire through VCLA, and fashion a whole new world out of them. What would you like to change, if you could? Melissa Baffa, the President of the Board of Directors of VCLA, serves as the Development Officer in charge of Foundation and Corporate Relations at the Santa Barbara Museum of Natural History and as an instructor with the Osher Lifelong Learning Institute at California State University, Channel Islands. Since 2015, she has been a Science Communication Fellow with the Ocean Exploration Trust, exploring the deep sea as part of Dr. Robert Ballard’s Corps of Exploration. 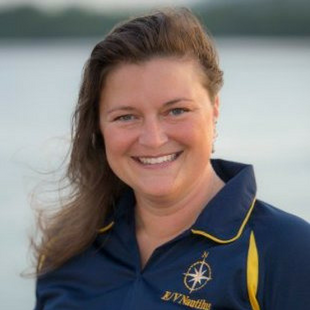 Melissa will serve as the Lead Science Communication Fellow (SCF) aboard the E/V Nautilus from October 20-November 1, 2018; the expedition will occur within the boundaries of the Monterey Bay National Marine Sanctuary, focusing on the exploration of the volcanic features of Davidson Seamount and the surrounding region. Visitors to Nautilus Live will be able to participate in the exploration in real time and submit questions; part of the duties of an SCF on watch is to moderate the discussion during exploration, integrating the questions submitted by viewers around the globe.